Sports: ideal to unwind from a day of chemistry! 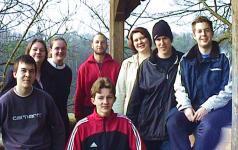 Depending on the season it is athletics or team games like volleyball or soccer! 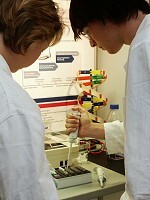 The extra course in biochemistry involves both theoretical and practical studies. Biochemistry plays an important role in German industry so some of us like Pavla hope to obtain the extra qualification in order to get an even better job in the future. 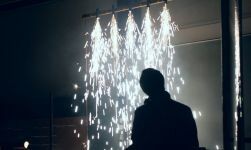 "Chemische Kabinettstücke" is a project where we learn "magical" chemical experiments which are often used in shows - from fireworks to chemical gardens and explosions ignited through your finger tip! This is where you can find out what special effects are all about - and it is a lot of fun! The workshop "Environmental Studies" does not only deal with theory, as you can see: we regularly monitor the water quality of a nearby lake and feed the data into the global students' network GLOBE (Global Learning and Observation to benefit the Environment). It is important to contribute to a large scale monitoring project since individual data do not really mean much! A brand new project is the microscope workshop: With the help of a former student of this school, Prof. Kage, we learn how to prepare samples to be analysed under the microscope. Quite thrilling are the different techniques with which we can observe objects that are normally invisible - like olivin crystals in polarised light. We are particularly proud of being a "School Against Racism"! In Stuttgart, people from a lot of different nations live and work together - mostly from Southern and Eastern Europe. In the past years our school has seen students from 53 different countries so we want to make sure that everybody has equal chances to learn and live here! In order to let our students understand different cultures we invite guests from all over the world, like the Team iThemba from South Africa (see picture). Even the mondialogo team is a mixture of nations: among many Germans Vanessa is US American and Pavla is Czech. 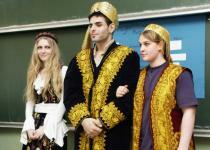 Therefore each year we have an international day which introduces other cultures to our students. 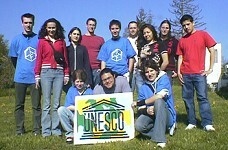 The goals of UNESCO are carried into the school life on an every day basis - international understanding, the care for our environment, an education which leads to a peaceful future: these ideas should not only be handled once a week for an hour or so, they should become a part of everybody's life! Important projects have been the Blue Danube River Project or the Baltic Sea Project. About a month ago we organized a sailing camp with two other schools on Lake Constance in order to get to know each other better - and it was great fun, too! Those of us who want to achieve something during their leisure time can do so within the International Award for Young People. This program offers a variety of areas in order to obtain key skills other than knowledge, for example social skills and sports or artistic hobbies. The most important task of the Award is to encourage young people to organize their free time in a sensible way - and to do it without anybody telling them to! The award is also quite well recognized in Germany which helps when you are looking for a job! And last but not least there was and is of course the mondialogo contest! We were asked last year in November whether we wanted to participate in the contest - and spontaneously a group of 18 students together with our teacher Miss Spiekermann volunteered to accept the challenge and go ahead with it! Unfortunately it took quite a long time until we found a team which was as eager to partcipate in mondialogo as we were - the TDH Stars from Petaling Jaya in Malaysia!